This will be round 3 of 3 in our 2018 Magnuson Superchargers Red List Series Championship. Points from each event and each racer will be totaled together upon the completion of the season and the racer with the highest amount of points total from all 3 2018 events will be crowned the 2018 Champion and given $3000 on top of whatever winnings they have already received in 2018. The Red List Group brings you the next installment, The Magnuson Superchargers Red List Series XII: #1320Nights which will be a race and car/truck show that will take place at Famoso Raceway. The event hosts everyone vs everyone Drag Racing where all racers fight for the #1 spot on the infamous Red List, $3500 in cash prizes for racers and a exhibit car/truck show for all the sick rides out here! The event expects many fans, racers, and show trucks/showcars from all around the West to attend and be part of an epic Saturday of racing! Who will be crowned as the next member of The Red List? The event draws racers and showcars/showtrucks from all over the Western region competing for a the grand prize and a spot in history. The racing event brings you side by side racing action from just about every type of car from Japanese Imports, Domestics, and exotic Euros in drag racing featuring the top underground, airstrip, and drag race cars in the country! Showcars and trucks will be battling it out for who has the best appeal and look on their rides! All of the online trash talking and bashing ends here; The Red List Series are the proving grounds to take your as one of the most feared racers in the racing world. Reputations will be tested, egos will be burned, friendships will be made, and rivalries will begin! What: 1/4 mile Drag Racing Competition and Car Show! When: Dec 15th 2018, Gates open at 7:00 AM. Mandatory drivers meeting at 9:30 AM. Deep in the Southern Californian Desert, high horsepower street cars have begun overwhelming the street and track scene up and down the west coast. These cars terrorized the streets and tracks throughout the West yet no proof outside of the region has ever been logged, until now. A list with the idea of housing the best drag racers in the entire West has now been created. History will never forget the most feared racers in the country as they become part of The Red list. Welcome to The Red List Series. For racing, NHRA rules and regulations as far is vehicle and personal safety equipment will be in effect in respect to certain ETs (i.e. Snell Approved helmets, Cages, Fire suits, Fire jackets, etc). We highly recommend fire suits and fire jackets, as well as other safety devices such as a HANSs device and fire extinguisher for all even if its not needed for your particular ET bracket. Show cars will be lined up on a first come first serve bases starting in the outside racing staging lanes and going back into the pit area. Come early to grab your spot quick next to all the action! 9:59 AM Drivers, start your engines!! For those that entered the Grand Prize Competition, Saturday is the racers day to shine and their chance to go home with $3500 in cash prizes, trophies, and best of all a spot on The Red List. Only the Top 125 scoring racers will be ranked. The highest scoring racer, #1, will take home to prize and become an official member of The Red List. If there is a tie in points, the person with the best average reaction time will take the lead over the other. General Safety: All vehicles and drivers with their personal safety gear must conform to the most up to date version of the NHRA rules for specific mile times the vehicles the driver is driving on the track with. Please review the most up to date version of the NHRA Rulebook online for information. Body: Must be GM bodied, Any year vehicle is allowed. Lightweight components are limited to hood, front fenders, decklid, trunks/hatches, sunroofs, wings, ground effects, roof, quarter panels and bumpers only. One-piece front ends are not permitted. Chassis: No full tubular framed vehicles allowed to compete for prize money but may make exhibition passes. Back halved vehicles allowed. Notching of chassis for clearance is permitted. Aftermarket K members are permitted. Suspension: Coil-overs allowed. Aftermarket front control arms, rear control arms, and sub-frame connectors are permitted. Aftermarket struts and shocks are permitted. Wheelie bars are prohibited on any car wanting to compete for prize money. Lights: Headlights and brake lights are required (one headlight may be removed for induction). Windows: Windshields must be OEM glass (Rear/Side windows only may be made of lexan). Interior: Dashboard is required. Passenger seat(s) and other interior panels may be removed. Aftermarket seats, gauges, and interior are permitted. Exhaust: Exhaust may exit anywhere. Driveline: Aftermarket axles, ring and pinions, final drive, spools, and differentials are permitted. Other OEM or aftermarket center sections and rear-ends may be replaced only if is a direct bolt in. IRS suspension cars may convert to straight axle only if it is a direct bolt in. Transmission: Manual or Auto transmissions are permitted. Any style automatic transmission is permitted. Trans-brakes are permitted. Manual transmissions are permitted to use aftermarket stock-style clutch assisted transmissions. Sequential transmissions are permitted. Aftermarket bell housings are permitted. Clutch: Any amount of discs can be used (any type of disk material is permitted). Clutch must be manually operated by drivers foot if car has manual transmission. Shifter: Shifter must be H-pattern to be considered 5 or 6 speed manual. Strain gauges are permitted. Air shifters are allowed. Fuel System: All fuel pumps are permitted. Aftermarket fuel cells are permitted, and may be mounted anywhere. Also, must conform to the most up to date version of the NHRA rules for specific mile times the vehicles run. Please review the most up to date version of the NHRA Rulebook online for information. Oiling System: Dry sump oil system or external oil pumps are only permitted on naturally aspirated cars, or if car was OEM equipped with a dry sump and car is using complete OEM oiling system. 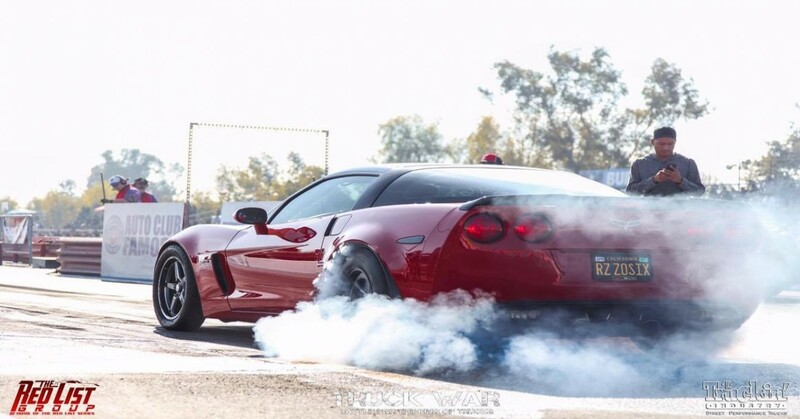 Tires: Drag slicks, Drag Radials, and Street tires are allowed. No size restriction any more. Cages: Must conform to the most up to date version of the NHRA rules for specific mile times the vehicles run. Please review the most up to date version of the NHRA Rulebook online for information. There will be only credits but no refunds due to our NO REFUND policy. Broken vehicles, missed flights, illness, flat tires, WEATHER, catastrophe or any other failures to participate due to unforeseen or foreseen circumstance will not result in refund. A credit may be given on case by case basis only if its requested 48hrs in advance or more. No credit will be given if not requested 48 hrs in advance from the start of the event. To receive credit, contact TheRedListGroup@gmail.com. RVs, trailers, and vehicles will not be allowed onto Famoso Raceway grounds until the day of the event. Once on the track property you may pit anywhere you would like outside of the VIP Pit Area and Sponsor area which will be marked off. Spectators are reminded that they may not park in pit area unless they have integral pieces of equipment that are needed to prep race cars. As an attendee of this event, violations to our rules and regulations, but not limited to, may result in being banned from the event without refunds. Thank you everyone who will be attending this event to race, support, watch, and have fun! In all of the hype and excitement, many rivalries will begin and friendships will be made. Make the most of the event, but keep your eye on the prize. Are you ready to make it onto The Red List?